A list of some Einstürzende Neubauten's bootlegs. This bootleg discography should provide information about various bootlegs for traders. Please remember, that if you buy bootlegs instead of trading, Einstürzende Neubauten will NOT receive any money from you, but the bootleggers will do. Visit their official site to support the band and to buy re-released albums. You can find bootleg traders in the forum (in the "Cross-Talk" forum). Yes, Einstürzende Neubauten permits that! Even if you have nothing to trade, maybe somebody will burn a couple of discs for you (you only send blank CDRs and pay for shipping). A recording of the historical first concert of Einstürzende Neubauten!!! Sounds as maniacal post punk! Good quality. Music is different from all official Neubauten's releases. Very recommended. Cassette. Also exists as CDR (sourced from the cassette and not tracked). Total Time: 40:21. This "livekassette" was recorded at EN's first live show, which took place at Moon in Berlin on the same day the band formed - April 1, 1980. The band line-up was Blixa, N.U. Unruh, Beate Bartel, and Gudrun Gut. Subtitled "Liveaufnahme in Kunstkopfstrereo"(or vice versa). 1st track is "Für den Untergang" by Einstürzende Neubauten, and sounds not live. Second and third tracks do not sound like Neubauten, but they are great! Excellent quality but some cuts, nearly 50 minutes. 01. Wollt ihr die totale Befriedigung? Vinyl bootleg. Also exists as CDR (sourced from the vinyl). Credited as "First Studio Recordings 1979", but it is a so-called Monogram Sampler (Monogram 006 LP) from year 1980 with 2 bands: Einstürzende Neubauten and Sentimentale Jugend (feat. Alex Hacke), 6 tracks, nearly 20 minutes. Each band performs 3 songs. This bootleg is aviable on online-auctions (e-bay), but it is very expensive. You can try to trade it instead of buying - it isn't rare!!! A compilation album of which EN snatched the whole B-side. Recorded September 1980. Bootleg. All songs originallly released on the Monogam sampler. This 12" mini-LP were packed in a cammo-coloured canvas bag. Very interesting compilation of rare early stuff. Good quality. Can be described as "Strategies Against Architecture 1,5". Many tracks were released on various rare albums, singles and compilations. This bootleg is aviable on online-auctions (e-bay), but it is very expensive. You can try to trade it instead of buying - it isn't rare!!! Audio CDR is sourced from the tape. Some tracks are divided into several parts, but I think, that it happened, because someone who did the mastering couldn't find a place, where one track is finished and another begins. ICA London / Atonal Festival Berlin / Danceteria N.Y.C. 1. ICA London, 03.01.84 (5 minutes), "Concert for machinery and voice"
A live bootleg with the recordings from 3 shows, sourced from the tape (first 2 parts on the side A, 3rd part on the side B). "ICA London" part is possibly together with Fad Gadget. This concert is reviewed in the EN-book "hoer mit schmerzen" by Klaus Maeck (page 49). "Atonal Festival Berlin" is the same as "Architektur & Geisselnahme". 03. Die Zeichnungen des Patienten O.T. Bootleg live recording Grüningen 25/8/85. The venue is possibly "Ijshall". 03. Zeichnungen des Patienten O.T. Vinyl. Live in Rotterdam, 1985. Also exists as CDR (sourced from the vinyl). 05. Die Zeichnungen des Patienten O.T. Cassette. Also exists as CDR (sourced from the tape). Very rare but bad quality. 09. Die Zeichnungen des Patienten O.T. Cassette. Also exists as CDR (sourced from the tape). Possibly "Myths, Monsters & Mutations Festival". Very rare, quality is bad but listenable. 04. Die Zeichnungen des Patienten O.T. Very rare, very good, but poor quality. ATTENTION: this show is offered here on MP3s (high bitrate!) for free. It was officialy available until june 2003, but the mp3s are stil there. Titled as "10xLive 1987"
02. Die Zeichnungen des Patienten O.T. 2x4 was officially released in the 1984 on cassette and re-released in 1997 on CD (ROIR USA, RUSCD8235). Sourced from the gigs: #1,4: Belgium 1982. #2: Berlin 1983. #3 Hamburg 1980. #5-7: Berlin 1982. #8: Amsterdam 1982. 11. Zeichnungen des Patienten O.T. Vinyl bootleg. Live in Bonn at Bisquithalle, 10.10.1989. Also exists as CDR (sourced from the vinyl). Vinyl bootleg. It is called "Chemnitz '90", but it is a recoding of the show at VEB Elektrokohle in East Berlin in 1989. Also exists as CDR (sourced from the vinyl). Nearly all the songs are credited not with their own titles, but using the lines from the lyrics. 13. (not mentioned) = Zeichnungen des Patienten O.T. 14. Zeichungen des Patienten O.T. A recording for german TV show "Rockpalast". Proffesional recording with good quality. Also exists as video-tape. CD or CDR, sourced from videocassette (VHS). This show was shown on german TV in the 1990-es, and many people recorded that. "Rockpalast" is still broadcasted by channel WDR, usually at nights from Saturday to Sunday. This TV programm is nearly 5 hours long and shows the recordings of concerts and festivals in Germany (sometimes even live!). Homepage: www.rockpalast.de. Another bootleg with the same recording for german TV show "Rockpalast" as above. CD or CDR, sourced from videocassette (VHS). Previous bootleg, "21.11.1990 Düsseldorf, Philipshalle", has 4 tracks more. Date of the show on the cover - 25.1.90 is absolutely wrong. This gig was on 21.11.1990. The recording for radio that was broadcasted in Germany in 1990-es. The recording was made on digital equipment, with the room mics in the hall. So, the quality is "excellent audience". Exists as cassette and as CDR (sourced from the cassette). 2 CDRs. Tracked not properly. The quality is rather good for a bootleg. CDR, medium quality, sourced from tape. Venue is called "Oz" or "O2"
The live show in Seattle, USA. 2 big tracks. 2CDRs, good quality (soundboard). Some songs are with few cuts. Very recommended! Tape, perhaps sourced from the internet (streaming audio or video). Very noisy, but listenable. Exists on 2CDRs (better quality) and 3CDRs (not tracked, lower quality). Nearly 135 min. Recording of the Atonal Festival 1999. There are few cuts in several tracks (NNNAAAMMM, Interimsliebenden). Einstuerzende Neubauten were back from the US tour and Blixa talks to the audience a lot. This show is great, as most of the last shows from the tour - when all the songs been played live regulary for weeks and monthes some of them begin to sound perfect as never before. A historical 20 years neubauten gig. 2CD or 2CDRs. Feautures live version of Stella Maris with Meret Becker. There exists a video recording of this show. Several songs from this this gig were broadcasted by french-german channel "arte" in 2000. CDR, Audience recording, incomplete. Some cuts. 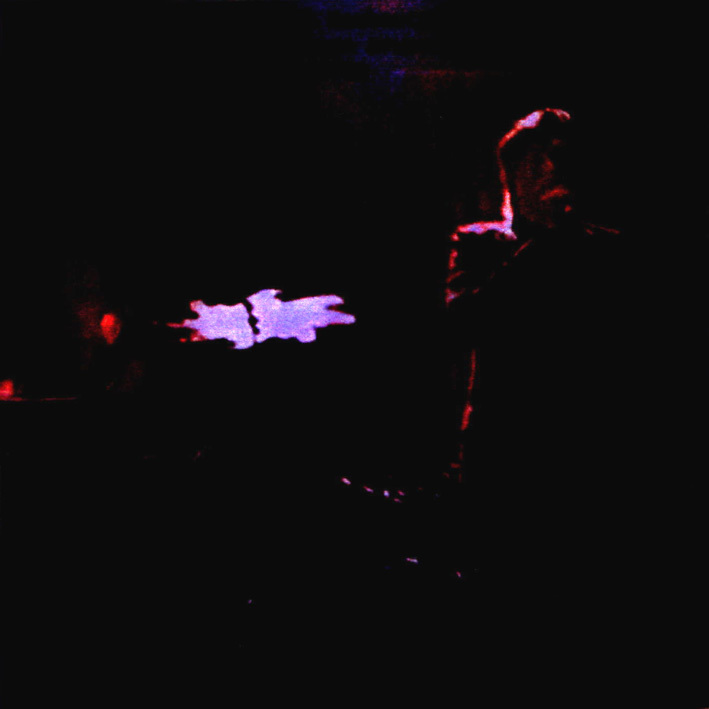 CDR, Audience recording, bad quality, rare. A recording of the 7/30/00 show at the 9:30 Club in Washington, DC, USA. Source: DAT. Not traded yet, but exists. Will hopefully receive better distribution by the end of the year. Live in Brussels, 15.09.2000. 2CDs or 2CDRs. This show was officially released by Einstürzende Neubauten in 2002 as "9-15-2000, Brussels" (LC 07149, POTOMAK) with much better quality, as on this bootleg. Duration : 79.54. (P) 2002 Tornado Records Ltd (reference # : BST-02-028). Possibly a russian bootleg. A compilation of officially released songs, a kind of "The Best Of". This one was sold on ebay. Following recordings should exist somewhere in the private collections. I don't have information for any of them. 31.10.1981 Wiesbaden with various other artists? 07.05.1985 Toronto, Ontario. Larry’s Hideaway 70 min (there are 2 different recordings of this show). C-60 Livekassette. 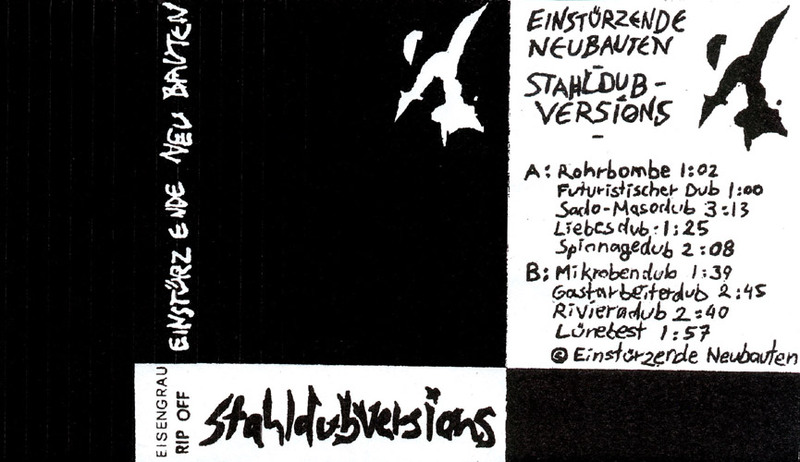 The same session as "Stahlversionen" on Für den Untergang 7". Originally sold with a tin plated cover, later rereleased in plain cover by Ripoff. Audio CDR is sourced from the tape. Last track is splitted into 2 parts. There are some clicks and cuts. Time: 38:45. This old tape (reissued on CD in the late 1990-es) was rereleased in 2003 with a new "Kollaps" edition. You can order this CD direct from Einstuerzende Neubauten at their mail order page. Selections date back to the beginning of the studio sessions for Kollaps in Hamburg. All tracks are instrumental. Some tracks later became the basis for other Neubauten songs: "Sado-Maso Dub" is the basis for "Tanz Debil"; "Rivieradub" later became "Zeichnungen des Patienten O.T.". Originally released as one of the limited edition Eisengrau cassettes. Rereleased during the late '90s in a limited edition, unlabelled CD release. Although all CDs are numbered out of 500, there were at least two pressings, one in '97 and one in 2000, meaning there are at least 1000 copies in print. CD with 2 tracks that comes with an English-Italian book about Einstürzende Neubauten. Also known as "Materiali Sonori". Italian release of a 96 pages book w/interviews, lyrics and discography, ltd to 20 000 copies.